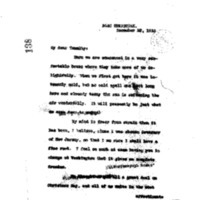 Woodrow Wilson writes to Joseph P. Tumulty during his Christmas holidays and mentions that he feels comfortable having Tumulty in control in Washington while he is away. Here we are ensconced in a very comfortable house where they take care of us delightfully. When we first got here it was intensely cold, but no cold spell can last long here and already today the sun is softening the air wonderfully. It will presently be just what we came down to enjoy. My mind is freer from strain than it has been, I believe, since I was chosen Governor of New Jersey, so that I am sure I shall have a fine rest. I feel so much at ease having you in charge at Washington that it gives me complete freedom. We thought of you all a great deal on Christmas Day, and all of us unite in the most affectionate greetings. Wilson, Woodrow, 1856-1924, “Woodrow Wilson to Joseph P. Tumulty,” 1913 December 27, WWP18250, First Year Wilson Papers, Woodrow Wilson Presidential Library & Museum, Staunton, Virginia.